Today, private construction is widespread. A special place is occupied by the construction of the floor in a house or apartment. Very often the wooden floor over time loses its original characteristics, which is the reason for the implementation of the repair. Many have no idea how to put a wooden floor. There are many different materials on the market from which you can make flooring. As for the floor as a whole, it can be made according to two technologies: as a result of laying the floor covering of wood on a concrete base or making the floor on the logs. In the latter case, a rough and finishing floor is made. The process of laying wooden floor can be divided into several stages: surface preparation, acquisition of necessary materials, erection of log, represented by bars, laying of a rough covering, insulation (if necessary), laying of a finishing covering and baseboards. Despite new construction technologies, wooden floors on logs have a number of advantages. They are environmentally friendly, durable, have good thermal insulation properties. Let us examine how to put the floor, what are the main stages of the work. You can lay the wooden floor with the help of experts or yourself. Works begin with the correct selection of material (wood). Wood for a wooden floor can be any. Each tree species has its own advantages and disadvantages. If you plan to install a finishing and subfloor, then the material will be different. For rough coating, it is advisable to use uncut boards or plywood (chipboard). Finish coating requires better material. The folding board or a board from a glued bar is applied. To put a wooden floor, you need to pick up wood. The best quality coating can be made of oak. It is durable and hard material. During operation, it does not change its shape, while the wooden floor is not warped. Pine wood is not as dense, but has a pleasant aroma. It is important that with a high resin content, pine cannot be used for flooring. 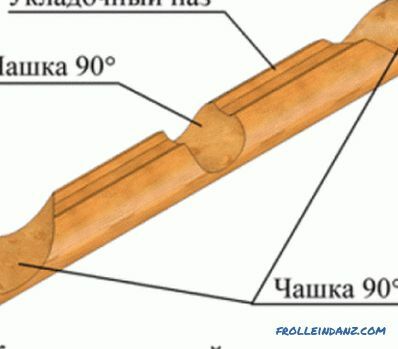 Otherwise, it is suitable for the manufacture of parquet. Larch wood in hardness is not inferior to oak. In addition, it is less susceptible to rotting and damage by insects. Larch does not absorb moisture and is resistant to low temperatures. 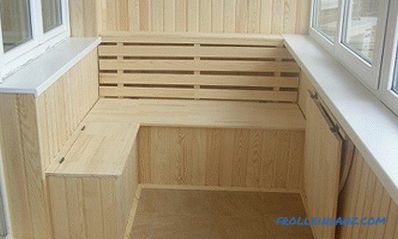 Maple, ash and other wood species can be used. To properly lay a wooden floor, wood must be taken dried, free of defects (cracks, knots) and black. It will be necessary to calculate the volume of the material, and you need to make a small stock of 10-15%. The length of the boards is taken from 2 meters or more. 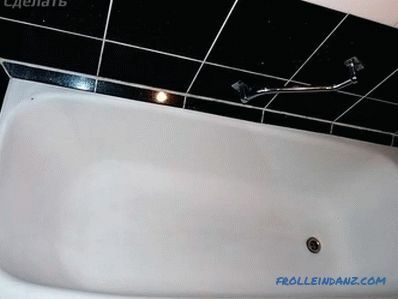 It is desirable that the boards were already polished. When choosing a material, it is important to consider the purpose of the room. If it is a kitchen or a bath, moisture-proof breeds will do. To lay the wooden floor, you will need to prepare the base. If it will be laid on a subgrade, it will first need to remove the top layer of soil to a depth of 20-25 cm from the ground surface. The space is filled with rubble. Over it the sand layer keeps within. Each layer needs to be wetted and carefully tamped. After this is a support for the log. 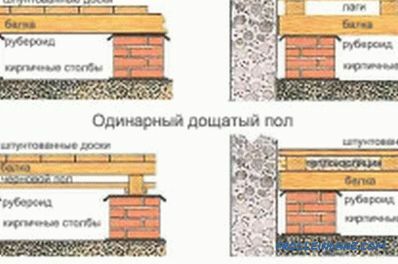 To do this, you need to build brick pillars with a height of 20 to 40 cm. Cement mortar is used to fasten bricks. The number of pillars depends on the length of the lag. If they are less than 3 m, then you will need 2 pillars (one end at each end). If the length of the boards is more, then another pillar is additionally placed in the middle. Their height is the same. 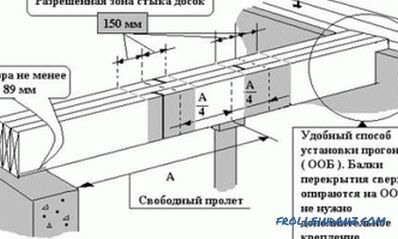 The evenness of the design is checked by a laser level or a simple thread. For building the lag, boards of 5 cm thickness and 10 cm width will fit. They are laid in parallel at a distance of about 60-100 cm between each other. Lags can be laid on a concrete base or attached to the walls of the structure. Immediately before putting the wooden floor, the boards for the lag are left in the room. If logs are mounted on a concrete base, then you will need dowels or anchors for fastening. To put a wooden floor and at the same time it was warm and durable, it is advisable to use a layer of insulation and waterproofing. 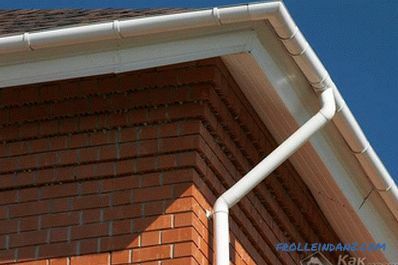 A polyethylene film is recommended as a waterproofing layer. It is laid between the lags. It is important to put it overlap (10 cm). The same allowance is recommended to make on the walls. Such a design will protect the flooring from water. 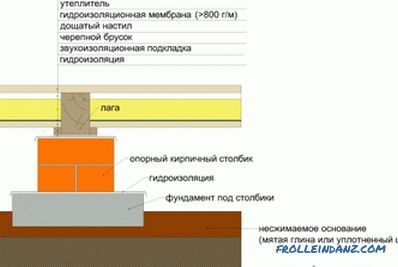 An alternative material for waterproofing - penofol. 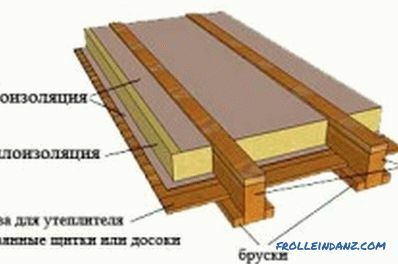 The next stage of the construction of a wooden floor - laying insulation.It is necessary to ensure that the floor does not freeze, especially if it is laid on the ground. Mineral wool, expanded polystyrene, izolon, expanded clay and even sawdust can act as a heater. Mineral wool is produced in thick sheets, while it is well cut. We must not forget that warming with mineral wool is carried out in gloves. 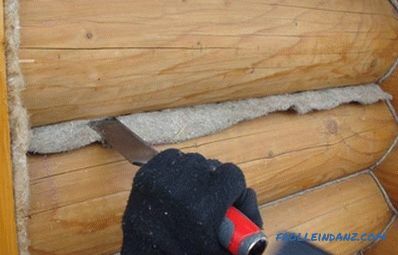 The thickness of the insulation depends on the height of the lag. On average, it is equal to 5 cm. At the same time, pieces of cotton are laid very tightly so that there are no gaps. More modern materials, such as expanded polystyrene, also have a noise-reducing effect. When all the preparatory work is done, you can proceed directly to the construction of finishing flooring. Boards are placed at right angles to the logs. It is necessary to fix them first in the middle and then from the sides. Start from the wall. It is there that the first board is laid. At the same time there should be a small distance from the wall of 1-2 cm. To fix the boards for a wooden house use screws. You will need to drill holes for them. Often plywood sheets are used as a subfloor. It is not suitable for rooms where the temperature is not constant. Plywood is attached to the logs with glue. Between the sheets left a small gap of 1-2 mm. 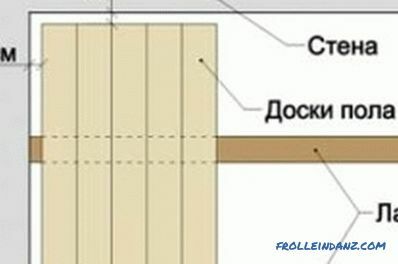 Scheme of the correct laying of the wooden floor. Sheets are additionally secured with screws. They will need about 8-9 per sheet. At the end of the construction of a wooden floor it needs to be leveled and polished. For this purpose, you can use the scraper machine. It is advisable to varnish or paint the floor above. To build a wooden floor, you may need to cut the boards. This is observed when their length is less than the width of the room. In this case, trimming should be put in such a way that their joint falls in the middle of the lag. The gaps between the wall and the boards are closed with plinths. 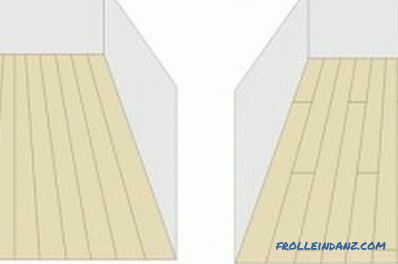 For a draft wooden floor, boards of 3–4 cm are taken. Very often, finished wooden floor is made of parquet or grooved boards. They hide fasteners. Each board connects to the previous one without screws or brackets. For this you can use a hammer. All this can be purchased at any hardware store. Thus, absolutely everyone can build a wooden floor, you only need to know the basic stages of installation. Of great importance is the choice of material (wood) and the preparation of the base. It is desirable to purchase natural raw materials. 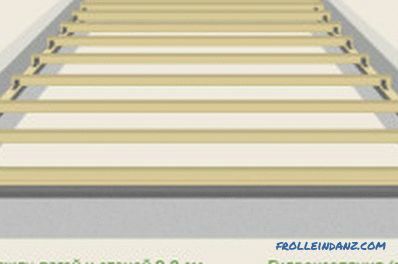 Boards for a fair floor must be from one batch, otherwise they may differ in color. For a strong construction, it is recommended to purchase thick boards. No need to ignore the insulation and waterproofing. The latter will protect the coating from condensation and water. If you follow all these rules, the wooden floor will last for many years and will delight with the beauty of its owners. Why is the Canadian felling attractive?